Transform Your Business... And Therefore Your Life! Transforms even a mediocre ad into an eye-opening winner, that DRAMATICALLY bumps your response and makes you a BOATLOAD of cash! Writing good sales copy isn't easy. Everyone knows that. And in fact, nowadays... merely being "good" isn't going to get you very far. If you want to sell something in today's day-and-age -- regardless of what it is -- your sales copy has to be compelling... without being pushy or obnoxious. Your prospects must feel you're empathizing with them, and... more than anything else, your sales copy must command attention! But here's the rub: At the same time, while you've got all these things going on, your sales pitch also has to be "invisible" to your prospects! The answer is simple: Your buyers don't want to be "told" what to do. They want to buy because they believe in what you're selling. And that's why, great sales copy is so engaging... you don't even realize you're reading a sales message. And that's how your prospects have to feel -- they can't "sense" they're being "pitched". They’ll Feel “Compelled” To Take Advantage Of Your Offer! Great sales copy reads like you're an old friend offering warm... caring... and sincere advice. Sales copy that produces results, reads like a "greased slide," from start-to-finish. It almost forces your prospects to buy from you... right now, without them even thinking about it. And once your have a sales letter that "works," it's almost like having a license to print money, whenever you want it. But hey, let's face it: Unless you're a damn good copywriter, it's nearly impossible to get your sales copy to stir-up that kind of emotional response in your prospects, isn't it? Somehow... Your Sales Copy MUST Do This! And that's because people buy things to satisfy their emotional wants. Oh sure, they may justify their purchases later on, using "logic." With thoughts like, "that was a great value"... or, "this model's going to make my life a lot easier..."
But make no mistake about it: What causes you prospects to buy, is some kind of emotional response you trigger, deep inside them. Just go back over some of your own buying decisions and you'll see what I mean. For example, Why did you chose to live in your neighborhood? Or, why'd you choose one doctor over another? Or where you sent your children to school. And everything else in-between. Weren't those decisions made, based on something you "felt?" But this isn't easy, is it? How do you consistently make this happen? Well, for starters... there's a lot of theories around about which of your prospect's emotional "buy-buttons" you need to push. Some "experts" say you should use "fear of loss" to get your prospects to do something. Others will tell you to rely on emotions like greed... hope... and vanity. And... sometimes they work too! The thing is, each of these emotional "triggers" will work, along with another 25 or 30 more, depending on what you're selling, and who you're selling it to. But which one of these emotional triggers should you use to sell your goods and services right now? And what's the best way of using them? IF... you can even identify what's wrong with it, in the first place! The good news is, now you can discover exactly how to tweak your sales copy to evoke the precise emotional responses you need, to generate more leads and increase your overall response rates. I'll Tell You Exactly How To Do This! to hire me to write your sales copy from scratch! Plus, I'll even go one step further: Because I'm so convinced you're going to find this service to be such a tremendous value... I'm willing to gamble 100% of my profits on it! I'll review the 7 Most Critical Components of your sales message, and tell you everything you need to do, to turn your display ad, sales letter, or website... into a nice little income stream for yourself. Your headline's responsible for as much as 80% of the success of your ad! Remember, your headline is the "ad for your ad." If it doesn't capture your prospect's attention in the first 1.5 seconds they see it -- your display ad, sales letter, or website -- is simply dead-in-the-water. You won't get a second chance with your headline, so you've got to make sure your first (and only) shot is a real winner. I'll show you all the proven tricks you need, to "turn up the volume" on your headline, so your prospects can hear it -- LOUD AND CLEAR-- even if it's barely audible right now! to listen to what you have to say! And boy-oh-boy, when it comes to writing sales copy, ain't that the truth! is like crashing their party, totally uninvited! And you've got about 5 seconds to convince the hosts of that party (your prospects), why they should let you in! You’ll have won them over, for many hours to come! The simple fact is, if you're opening's not compelling and interesting... you don't have a snowball's chance in hell of ever making your sale! As part of your 7-Step Sales Copy Overhaul, I'll reveal what you need to know, so your buyers don't send you packing! Your actual story or sales message! Most sales copy tells you virtually "nothing", when it comes to the actual "meat" of your message. through ALL the clutter in your prospect’s life! And telling your prospects things like, your name and how long you've been in business... and then saying a few general features about your product or service -- things like, "Biggest steakhouse in Texas!" or... "Satisfaction Guaranteed!" or, "We'll give you everything you need..." amounts to doing absolutely nothing, as far as getting your prospects to buy from you. The reason is, claims like this are thrown around so often, and they're so vague, they don't even get noticed any more. Claims like this pale in comparison to sharing a believable story with your buyers. Is Like Trying To Win The Indy 500... Driving... A Skateboard! It's just NOT going to happen -- you simply will not get through to them. I'll show you how to fix your sales message so it's compelling and exciting for your prospects, and attracting sales... instead of repelling them (which is what almost all sales messages are usually doing). Most offers are so "vanilla"... they couldn't even sell ice-water to construction workers repairing the highway on a dripping wet summer day in the middle of Florida? If you want to make your cash register go “ka-ching!,” your offer needs to contain a fat, juicy, compelling promise, wrapped snugly inside a warm "safe" guarantee, your prospect can REALLY sink their teeth into. bouquet of Spring flowers, still damp from this morning’s dew! Your compelling reason to act now! Are you giving your prospects a compelling reason to take action and buy from you... right now? Is it believable? Will your buyers feel that it's REAL? And is it really compelling enough? I'll help you create a meaningful, believable sense of urgency, that works. And don't worry -- this is something nearly everyone struggles with (especially online), so you're not alone. Meaning, what is it you want your prospects to do? For example, how are they supposed to place their order? Should they call your toll-free number between 9 a.m. and 5 p.m.? Should they come by your store on Tuesday and Thursdays for the "After School Special?" Or should they "Click here to be taken directly to our secure web page"? See, very few sales messages give you a specific step-by-step call-to-action. Yours must, if you want to maximize your sales... and I'll show you exactly how to do it, AND how to track your orders, so you can measure your response rates. Most sales messages don't even have a P.S. And NOT using a P.S. is a mistake, and... a tremendous missed opportunity. Because sometimes... the ONLY thing your prospect reads, is your headline... a sub-headline or 2 along the way... and your P.S.! But if you don't have one, you're missing what may be your last, and in some cases... your only opportunity to make your sale! If you do have a P.S., I'll make sure you're not missing your mark, and if you don't have one... I'll clue you in on how to sharpen your pencil and create one. Having a P.S. is not only critical, but oftentimes, if your P.S. is strong enough, it actually ends up MAKING your sale for you. These are the components of your 7-Step Sales Copy Overhaul. The fact is, by the time your sales copy overhaul is done, you'll be fully-armed and stacked to the rafters with all the hard-hitting direct-response sales copy and marketing ammunition you need... to turn even a mediocre display ad... sales letter... or website, into a very powerful, very effective, sales piece. “During the time I spent with Craig, I learned (and re-learned) more about the flaws in my copy, than I have over the last 12 years. His grasp of which words move people into action -- is so comprehensive, so damned obvious ("Why didn't I think of that before?") and so easily explained -- that you'll just want to slam down the phone and get re-writing that very instant. and widely-published author and speaker in the United Kingdom. The most important lesson I learned from Craig's review, was that I could write a decent sales copy, by following his guidelines and taking care with my story. Craig's ideas were unbelievable, he seemed to be brimming with opportunities and ideas I had not even thought of. A lot of his suggestions were simple and yet inspiring, he opened my eyes to possibilities I hadn't thought of. I know that some of his ideas will be a success when I use them, and I am very confident that Craig's recommendations will help in my copy and marketing. "Craig, thanks again for all the advice, I really appreciate all the help. It definitely made a difference. Your ripping my copy apart literally forced me to get back to the "basics" and reframe my entire sales pitch. certainty - made a gigantic difference. Not just with that letter but with all the other stuff I have done since. In fact, if I hadn't reframed the pitch, dug back into the basics and cut out all the redundant stuff (it's less than half the length it was originally), I'm positive it would have bombed big time. If You Can't Handle Candid Criticism... This Service Is Not For You! Look, I know this may sound funny... but this 7-Step Sales Copy Overhaul may NOT be for you! See, I know exactly how much time-and-effort you put into writing your sales copy, and how difficult it was for you to put it together in the first place. And believe me, I know it hurts when someone punches holes in something you've poured your heart and soul into. But if you want to discover how to turn a lame duck sales message into one that consistently attracts prospects... or if you want to turn your already "pretty good" ad into one that's really setting records, month-in and month-out... then you've got to accept the fact that your ad's probably going to need some serious work! But this is what allows you to start making more money. It's no different from working with a trainer who gets you in shape, down at the gym. If you're not open to doing things differently... it's going to be pretty hard to start getting different results. Having a lot more fun running your business! So if you can't handle some candid, but very constructive criticism...then this service is definitely NOT for you! On the other hand, if you can handle it -- if you're committed to your success, and if you're excited about having your newly polished sales copy start performing as reliably as a Swiss watch... then ordering your 7-Step Sales Copy Overhaul, is going to be the most important and most worthwhile investment you ever make! You can order your 7-Step Sales Copy Overhaul along with a very special FREE bonus, right now. I'll dissect your display ad... sales letter... or website... reviewing each of your 7 Most Critical Components of your sales message. You'll discover exactly what you need to turn your ad into an attention-getting money-making machine! You'll get my full attention and focus over the telephone, one-on-one. And believe me, I'll be very specific in giving you guidance and help. you should use... to sell your goods and servcies. And whether you realize it or not, strategy is everything. You can have the best sales copy in the world, but if you selling strategy is flawed, it's not going to get you anywhere. On the other hand, even mediocre sales copy will perform well, if your selling strategy is optimized. Look, I charge $60,000 plus 3% royalties to write sales copy, and $7,500 for a full day of consulting. 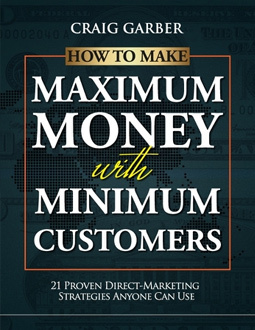 And, as I reveal inside my book, "How To Make Maximum Money With Minimum Customers," I made over $578,000 in one year, with a small online list (e-mail list, NOT customer list) of less than 5,000 names, without spending even one thin dime on advertising. What I'm saying is, people pay me lots of money because I deliver big results. Getting the right strategy, is easily worth tens of thousands of dollars. Not to mention, how many thousands you'll avoid wasting because you were going at things the wrong way. One: Order your 7-Step Sales Copy Overhaul right now. After it's done, if you're not satisfied with it, let me know, and I'll give you a prompt and courteous 100% full refund. You heard me -- if you're not satisfied... just let me know and I'll issue you a full refund. See, maybe I'm "old school", but... when I was growing up, a handshake meant a lot more to people than any legal document any lawyer could ever draw up. And call me silly, but I miss those days when your word was your bond. So let's just say this guarantee is my "handshake", or... my personal promise to you. And two: On top of that, if the recommendations I make don't boost your response rates dramatically -- just show me what you did and what the results were, and if my recommendations didn't produce for you, I'll give you a 100% prompt and courteous refund, no problem. Sales copy reviews are $1,497. Which pales in comparison to the return on your investment you're about to get. Simply place your order below, and then you'll immediately receive detailed instructions on how to send me the sales copy you'd like me to review, via e-mail. You'll also be contacted by my assistant within two business days, to schedule your appointment. "Yes Craig, please help me fix my sales copy. I'm sick and tired of losing money and missing out on leads who are ignoring me, because my sales messages simply aren't compelling enough." Thank you for reading this message I'll look forward to reviewing your copy, soon! “What excuse will you make, when your marketing still isn’t "clicking,"
Because if you think $1,497 is a steep price to pay, I can tell you from experience, you're going to lose a LOT more than this on the next sales letter you roll out, because of the all the things you're doing wrong. It's Practically Kicking Your Door Down! So do yourself a HUGE favor, and get the ball rolling on this now. Listen, Craig hates these pop-ups just as much as you do. But until you figure out a better way for him to get your attention, then I'm afraid... this... is it!